Here are some ways to find and Start the Windows 8.1 / 10 Task Manager, or create a Desktop Shortcut for the taskmgr.exe and Pin to Windows 8.1 or Windows 10 Start! 1.) Via [Ctrl + Alt + Del], and then Task Manager! 2.) 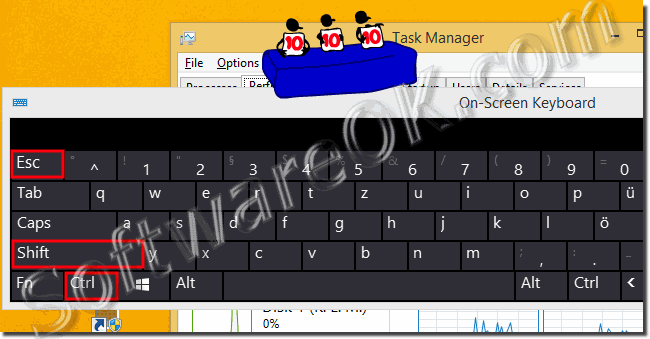 Direct start the Windows 8.1 Task Manager! 3.) 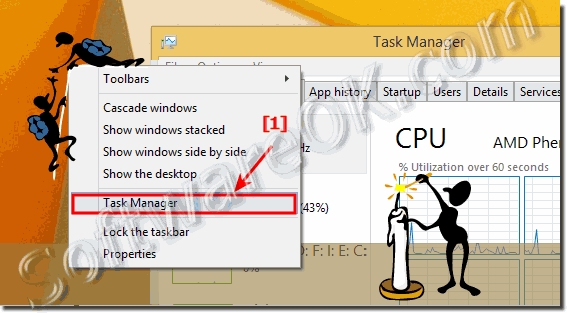 Run the Task-Manager via WindowsX menu in Win 8.1! 4.) 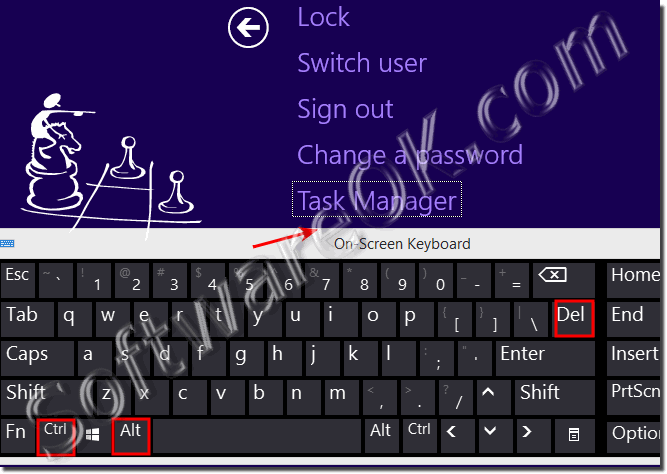 Start Task-Manager via Desktop Task-Bar right-click! 5.) Open the Task Manager via the Windows 8.1 MS-Explorer address bar! 6.) Run via the Run-Dialog the Taskmgr.exe! 7.) Desktop shortcut to run the Task Manager in Windows 8.1 / 8! 8.) Pin Task-Manager in Windows 8.1 Start! 1.) Run, via [Ctrl + Alt + Del], and then Task Manager! 2.) Direct run the Windows 8.1 Task Manager! Without detours and the fastest way to start the Task Manager in all Windows operating systems, is the keyboard shortcut [Ctrl + Shift + ESC]! 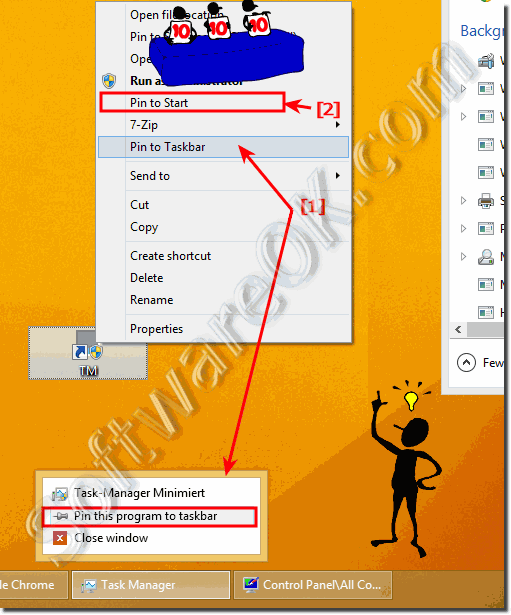 (Image-2) Fastest way to open the Task Manager in Windows! 3.) Start the Task-Manager via WindowsX menu in Win 8.1! Use Windows-X menu, keyboard combination (shortcut) [Windows logo + X] to start the Task Manager! (Image-3) Task-Manager in Windows-X menu! 4.) Open Task-Manager via Desktop Task-Bar right-click! If you are using the mouse, particularly in the area of ​​the Windows 8.1 taskbar, run the TM by simply right clicking on the Windows 8.1 Desk-Task-Bar! 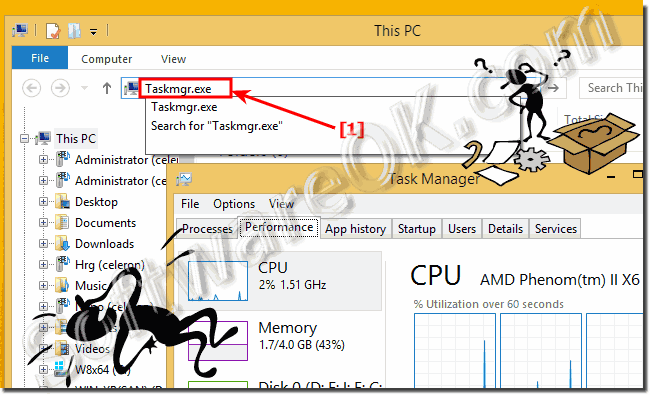 (Image-4) Find the Windows Task Manager in Desktop Task-Bar! 5.) Start the Task Manager via the Windows 8.1 MS-Explorer address bar! %WINDIR%/System32/Taskmgr.exe, or only Taskmgr.exe. And he is here! The Windows 8.1 Task Manager :-)! (Image-5) Windows Task Manager via MS-Explorer! 6.) Start via the Run-Dialog the Taskmgr.exe! Via the Windows Run dialog [Windows Logo] + [R] and the taskmgr command runs also the Windows 8 Task Manager! 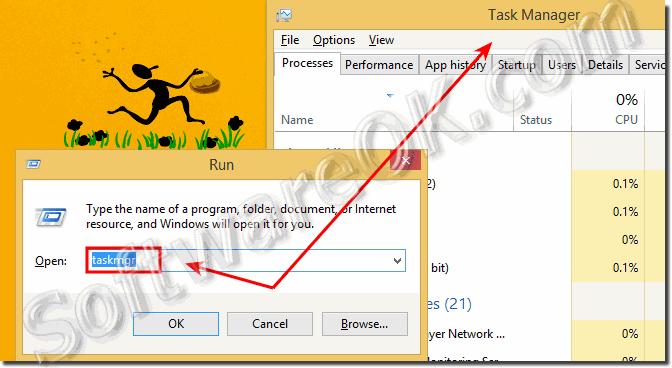 (Image-6) Open the Task Manager via Windows RUN-Dialog! You can quite quickly create a desktop shortcut for the Task Manager in Windows 8.1. 8.) Pinn the Taskmanager on Windows 8.1 start! One simply click on the Desktop-Link to the Task Manager (right-click) and select the option to "Pin to Start"
(Image-7) Pin Task Manager Windows 8.1 Task-Bar and Start! 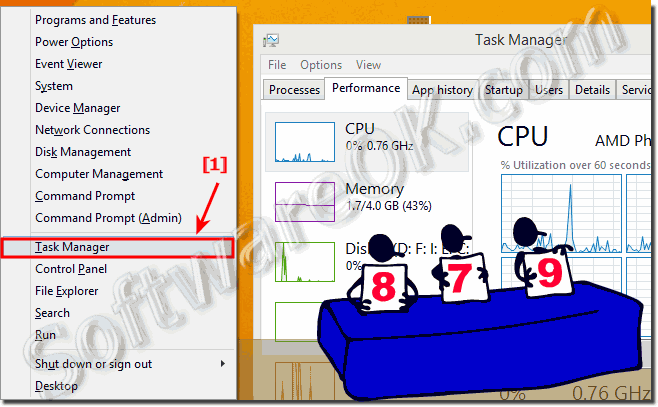 Windows-8 - FAQ-188: Where is the Task Manager in Windows 8.1, 8 and 10!